It’s been a while since we posted anything under the “Foto Friday” category, but some of you miss it so hopefully this will be back in regular rotation again. 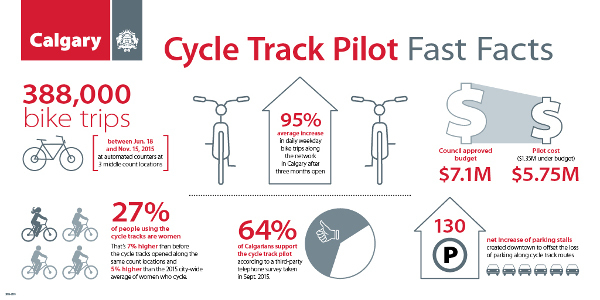 From the People for Bikes blog, good news about the Calgary bike lane network – which isn’t too dissimilar from what’s being proposed as part of the Downtown Mobility Plan here in San Diego. 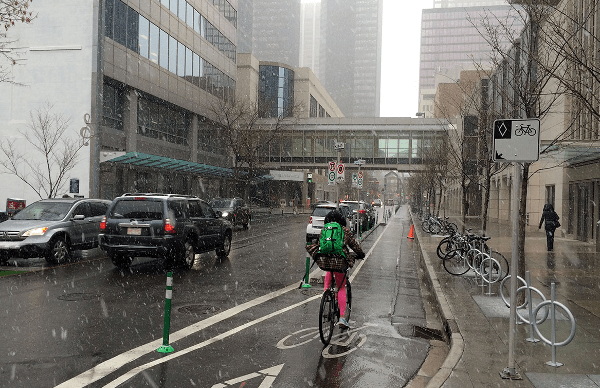 And on this cold and somewhat rainy day here in San Diego, perhaps we can appreciate the woman in the photo above riding on Calgary’s (still new) protected bike lane network and imagine how neat it would be if we could get that here too. Brad Richter, the shepherd of the Downtown Mobility Plan, specifically brought up Calgary (with slides!) at the last Civic SD meeting. He mentioned the similarities between San Diego in terms of size and shape and how their bike network success is partially based on building the whole thing at once. Must the Planning Commission approve it before it moves to the Smart Growth Committee? Must that committee approve it before it gets to City Council? The DMP website and BikeSD’s coverage have been great and at the same time it would be nice to have more clarity on the process and how to help push it forward as an advocate.